Download "Producers/Agents Moving to Arkansas"
1 (Rev. 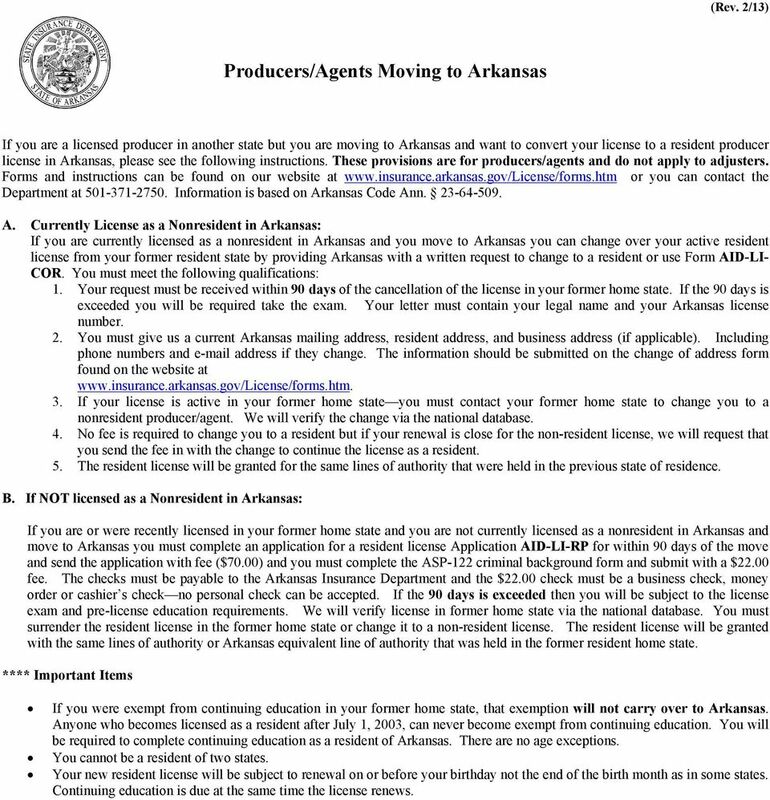 2/13) Producers/Agents Moving to Arkansas If you are a licensed producer in another state but you are moving to Arkansas and want to convert your license to a resident producer license in Arkansas, please see the following instructions. These provisions are for producers/agents and do not apply to adjusters. Forms and instructions can be found on our website at or you can contact the Department at Information is based on Arkansas Code Ann A. 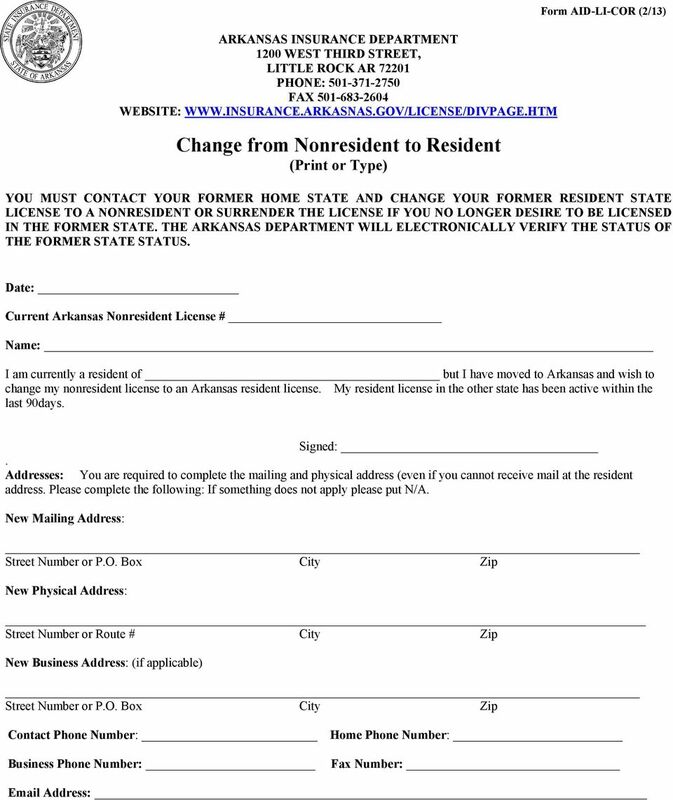 Currently License as a Nonresident in Arkansas: If you are currently licensed as a nonresident in Arkansas and you move to Arkansas you can change over your active resident license from your former resident state by providing Arkansas with a written request to change to a resident or use Form AID-LI- COR. You must meet the following qualifications: 1. Your request must be received within 90 days of the cancellation of the license in your former home state. If the 90 days is exceeded you will be required take the exam. 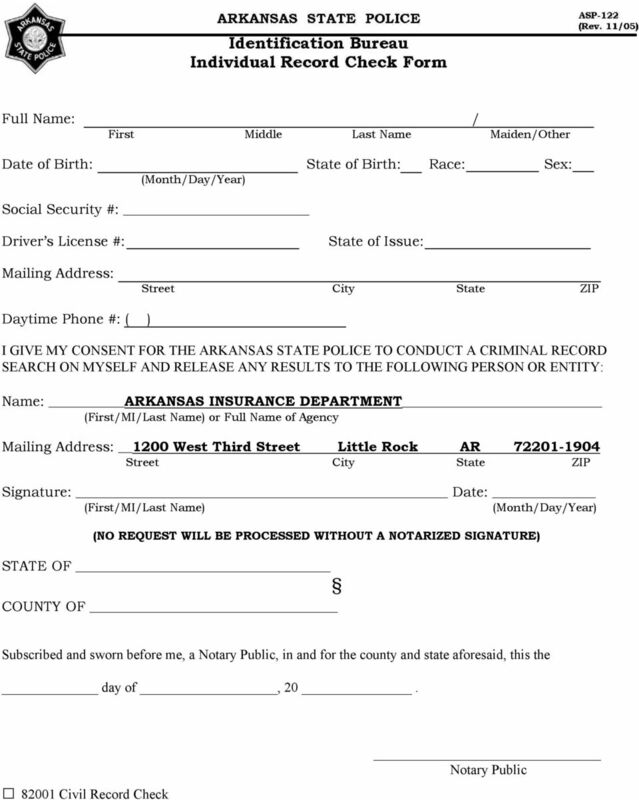 Your letter must contain your legal name and your Arkansas license number. 2. You must give us a current Arkansas mailing address, resident address, and business address (if applicable). Including phone numbers and address if they change. The information should be submitted on the change of address form found on the website at 3. If your license is active in your former home state you must contact your former home state to change you to a nonresident producer/agent. We will verify the change via the national database. 4. No fee is required to change you to a resident but if your renewal is close for the non-resident license, we will request that you send the fee in with the change to continue the license as a resident. 5. The resident license will be granted for the same lines of authority that were held in the previous state of residence. B. If NOT licensed as a Nonresident in Arkansas: If you are or were recently licensed in your former home state and you are not currently licensed as a nonresident in Arkansas and move to Arkansas you must complete an application for a resident license Application AID-LI-RP for within 90 days of the move and send the application with fee ($70.00) and you must complete the ASP-122 criminal background form and submit with a $22.00 fee. The checks must be payable to the Arkansas Insurance Department and the $22.00 check must be a business check, money order or cashier s check no personal check can be accepted. If the 90 days is exceeded then you will be subject to the license exam and pre-license education requirements. We will verify license in former home state via the national database. You must surrender the resident license in the former home state or change it to a non-resident license. The resident license will be granted with the same lines of authority or Arkansas equivalent line of authority that was held in the former resident home state. **** Important Items If you were exempt from continuing education in your former home state, that exemption will not carry over to Arkansas. Anyone who becomes licensed as a resident after July 1, 2003, can never become exempt from continuing education. 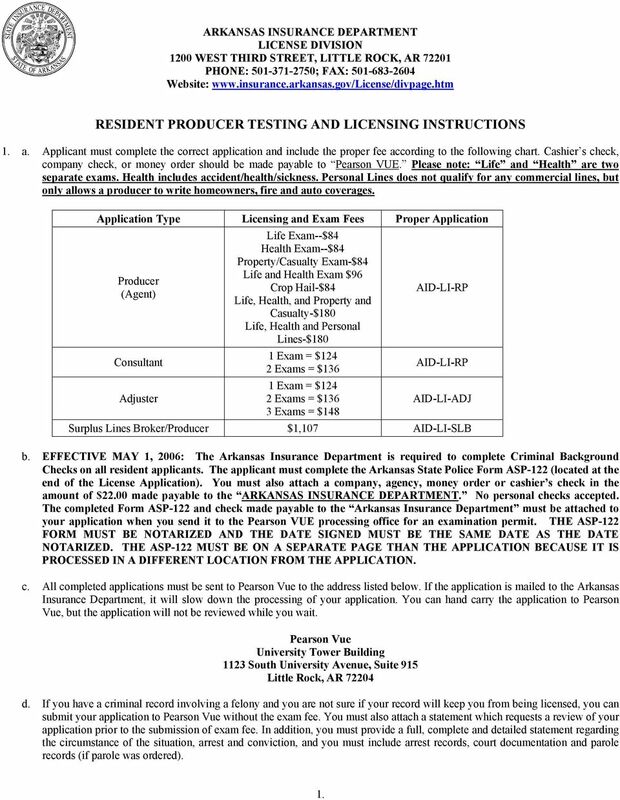 You will be required to complete continuing education as a resident of Arkansas. There are no age exceptions. You cannot be a resident of two states. Your new resident license will be subject to renewal on or before your birthday not the end of the birth month as in some states. Continuing education is due at the same time the license renews. 3 Rev. 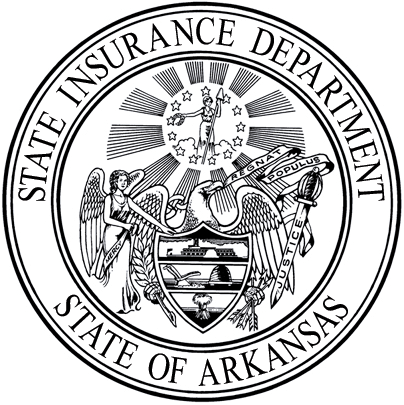 9/2012 ARKANSAS INSURANCE DEPARTMENT LICENSE DIVISION 1200 WEST THIRD STREET, LITTLE ROCK, AR PHONE: ; FAX: Website: RESIDENT PRODUCER TESTING AND LICENSING INSTRUCTIONS 1. a. Applicant must complete the correct application and include the proper fee according to the following chart. Cashier s check, company check, or money order should be made payable to Pearson VUE. Please note: Life and Health are two separate exams. Health includes accident/health/sickness. Personal Lines does not qualify for any commercial lines, but only allows a producer to write homeowners, fire and auto coverages. Application Type Licensing and Exam Fees Proper Application Producer (Agent) Consultant Adjuster Life Exam--$84 Health Exam--$84 Property/Casualty Exam-$84 Life and Health Exam $96 Crop Hail-$84 Life, Health, and Property and Casualty-$180 Life, Health and Personal Lines-$180 1 Exam = $124 2 Exams = $136 1 Exam = $124 2 Exams = $136 3 Exams = $148 AID-LI-RP AID-LI-RP AID-LI-ADJ Surplus Lines Broker/Producer $1,107 AID-LI-SLB b. EFFECTIVE MAY 1, 2006: The Arkansas Insurance Department is required to complete Criminal Background Checks on all resident applicants. The applicant must complete the Arkansas State Police Form ASP-122 (located at the end of the License Application). You must also attach a company, agency, money order or cashier s check in the amount of $22.00 made payable to the ARKANSAS INSURANCE DEPARTMENT. No personal checks accepted. 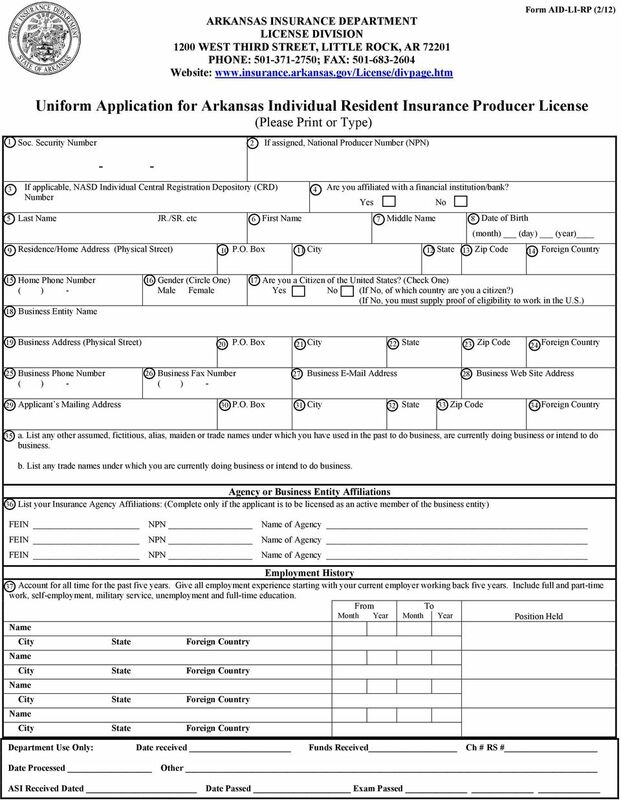 The completed Form ASP-122 and check made payable to the Arkansas Insurance Department must be attached to your application when you send it to the Pearson VUE processing office for an examination permit. THE ASP-122 FORM MUST BE NOTARIZED AND THE DATE SIGNED MUST BE THE SAME DATE AS THE DATE NOTARIZED. THE ASP-122 MUST BE ON A SEPARATE PAGE THAN THE APPLICATION BECAUSE IT IS PROCESSED IN A DIFFERENT LOCATION FROM THE APPLICATION. c. All completed applications must be sent to Pearson Vue to the address listed below. 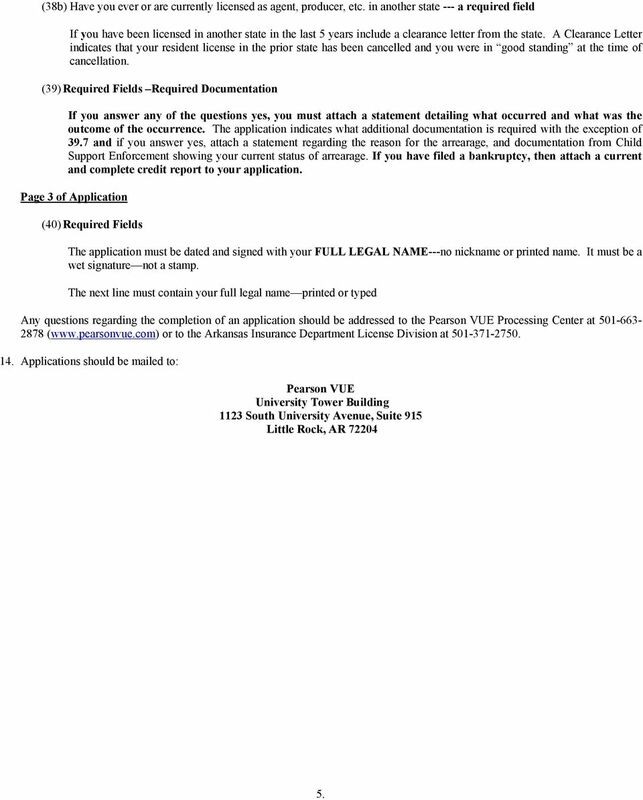 If the application is mailed to the Arkansas Insurance Department, it will slow down the processing of your application. You can hand carry the application to Pearson Vue, but the application will not be reviewed while you wait. Pearson Vue University Tower Building 1123 South University Avenue, Suite 915 Little Rock, AR d. If you have a criminal record involving a felony and you are not sure if your record will keep you from being licensed, you can submit your application to Pearson Vue without the exam fee. You must also attach a statement which requests a review of your application prior to the submission of exam fee. In addition, you must provide a full, complete and detailed statement regarding the circumstance of the situation, arrest and conviction, and you must include arrest records, court documentation and parole records (if parole was ordered). 1. 4 2. This fee includes all initial Arkansas licensing fees and the initial examination fee. These fees are fully earned when the application is processed. These fees are not refundable. 3. The examination permit is good for only 90 days. If the applicant has not taken the examination in that period of time, a new application and new fees will be required. 4. Once the applicant has received an examination permit, the applicant must contact Pearson VUE at to schedule a test date. The test date cannot be scheduled until the applicant has the permit in hand. 5. If the applicant has held a license in another state, a letter of clearance must be submitted with the application if the previous state does not report license information to the National Database. 6. The applicant must be at least 18 years of age or if not of legal age, minority rights must be removed by a court order and a copy of the court order must be forwarded along with the application and fees. 7. There are pre-license education requirements that must be completed prior to taking the examination for Life, Accident/Health/Sickness, Property, Casualty, and/or Personal Lines. A candidate must present a certificate of completion at the time the candidate arrives for the examination. If the candidate does not have the certificate, the candidate will not be allowed to sit for the examination. The majority of the pre-license course must be completed by classroom education, but up to 5 hours of the pre-license education can be completed by electronic media (Arkansas Law and Ethics are excluded from electronic media selfstudy). A listing of all pre-license education providers is available on the License Division Web site in the Online Searches section at The course is good for 2 years from the date of completion. The hours required are: Life: 20 Hours Health (Accident/Health/Sickness): 20 Hours Property: 20 Hours Casualty: 20 Hours Personal Lines: 20 Hours 8. Applicants must present two forms of positive identification at the test center on the date of examination - one with a signature and a photograph (preferably a driver s license), and one additional signature identification card. Candidates appearing for examination without proper identification will not be admitted to the examination and will forfeit prepaid examination fees. 9. If the applicant fails the examination, the applicant must call Pearson VUE at to make a new exam reservation. A reexamination fee of $62 for one examination or $74 for two examinations in the same exam session must be submitted at the test center on the date of examination. Fees must be made payable to Pearson VUE and must be in the form of a cashier s check, company check, or money order. NO cash, personal checks, or credit cards will be accepted. Reexamination must occur within 90 days of the date the original examination permit was issued. 10. Any applicant failing the examination three (3) times will be required to wait 4 weeks to retake the examination. 11. The examination will be scored at the test center on the date of examination. 12. Licenses will be issued to candidates successfully completing the examination at the test center; however, in order to begin transacting insurance business, a completed appointment form must be submitted to the Department of Insurance. 13. How to complete the License Application: Since an application is a legal form, certain fields of information are required and must be completed prior to the application being processed. If the required information is not disclosed on the application, the application will be returned for completion. These instructions illustrate the specific areas of the application that must have responses before the application can be processed. If the information is required, the item is marked a required field, and you must provide us with this information. If you reach a line which is not required and the question does not apply to you, then mark the line N/A. However, if you have information you can include it in the non-required filed -- one example is your address. If the Department has your address, we can send e- mail notices of important changes to laws and rules that govern your license. If the application is over 30 days at the time of submission, it will be returned for current information. If the application is returned for corrections, it must be returned to the processing office within 10 working days -- if the application is not returned promptly, then a new current application and criminal background form will be required. 2. 5 *This is a legal document, corrections should be made by drawing one line through the incorrect information, do not scratch out the information or use liquid paper. Changes or corrections must be initialed by the applicant showing that the applicant made the change. It is not legal for anyone other than the applicant to complete the application or modify it by removing or adding information. The applicant is held liable for all the information on the application. *Illegible applications will be returned since we will be unable to review them. Important: If you have a past criminal record, tax lien or other item which would normally require a yes answer and you are not sure if it has been resolved, sealed, or completed, then we suggest you answer yes and provide an explanation. When in doubt answer yes, provide an explanation and documentation, and if it is not needed the Department will disregard the information and your application will be processed quicker. If a criminal record has been sealed, then you should have a document signed by a judge which shows the record has been sealed. There is no time limitation on criminal convictions -- even if it is 20 years old, it will still show up on the criminal background search. Failure to disclose information on the application that is required can cause the application to be declined, or may be grounds to have a license revoked at a later date. 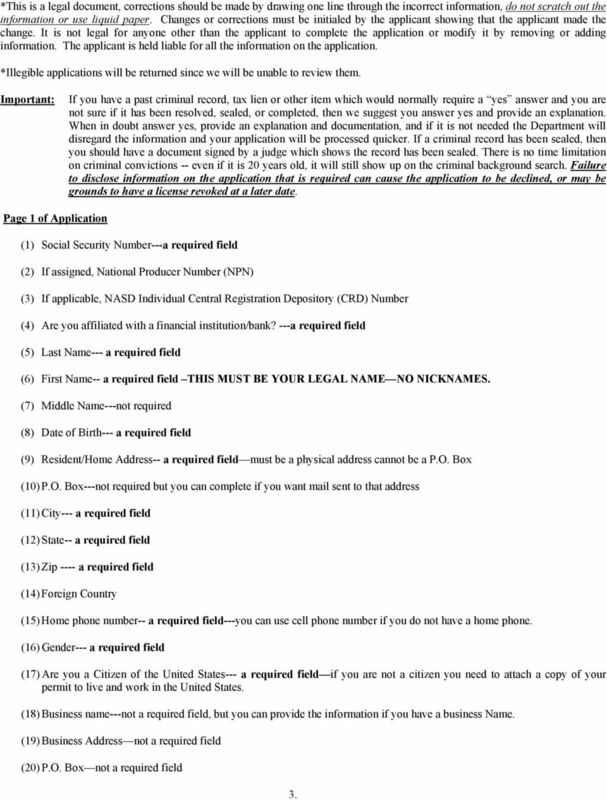 Page 1 of Application (1) Social Security Number---a required field (2) If assigned, National Producer Number (NPN) (3) If applicable, NASD Individual Central Registration Depository (CRD) Number (4) Are you affiliated with a financial institution/bank? ---a required field (5) Last Name--- a required field (6) First Name-- a required field THIS MUST BE YOUR LEGAL NAME NO NICKNAMES. (7) Middle Name---not required (8) Date of Birth--- a required field (9) Resident/Home Address-- a required field must be a physical address cannot be a P.O. Box (10) P.O. Box---not required but you can complete if you want mail sent to that address (11) City--- a required field (12) State-- a required field (13) Zip ---- a required field (14) Foreign Country (15) Home phone number-- a required field---you can use cell phone number if you do not have a home phone. (16) Gender--- a required field (17) Are you a Citizen of the United States--- a required field if you are not a citizen you need to attach a copy of your permit to live and work in the United States. (18) Business name---not a required field, but you can provide the information if you have a business Name. (19) Business Address not a required field (20) P.O. Box not a required field 3. 6 (21) City-not a required field (22) State not a required field (23) Zip not a required field (24) Foreign Country (25) Business Phone Number not a required field (26) Business Fax Number not a required field (27) Business Address not a required field ( address information should be given so you can receive information from the Department. 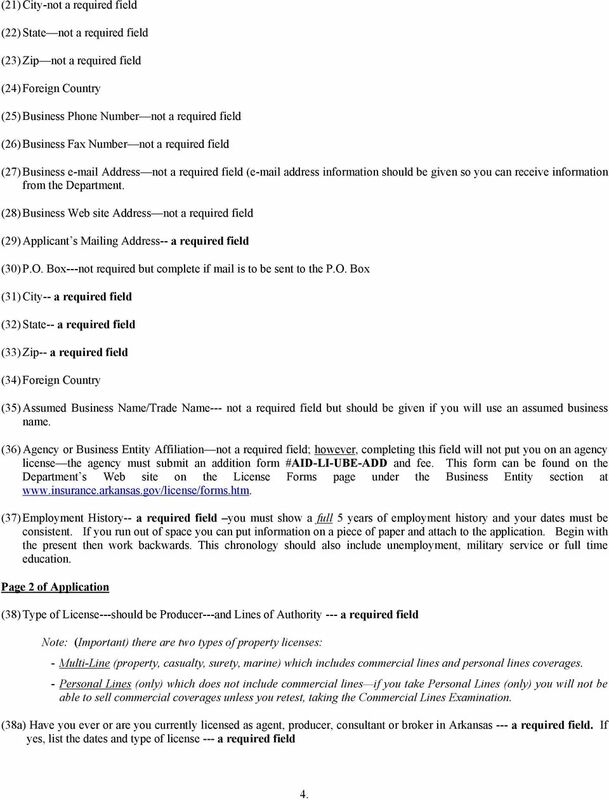 (28) Business Web site Address not a required field (29) Applicant s Mailing Address-- a required field (30) P.O. Box---not required but complete if mail is to be sent to the P.O. Box (31) City-- a required field (32) State-- a required field (33) Zip-- a required field (34) Foreign Country (35) Assumed Business Name/Trade Name--- not a required field but should be given if you will use an assumed business name. (36) Agency or Business Entity Affiliation not a required field; however, completing this field will not put you on an agency license the agency must submit an addition form #AID-LI-UBE-ADD and fee. 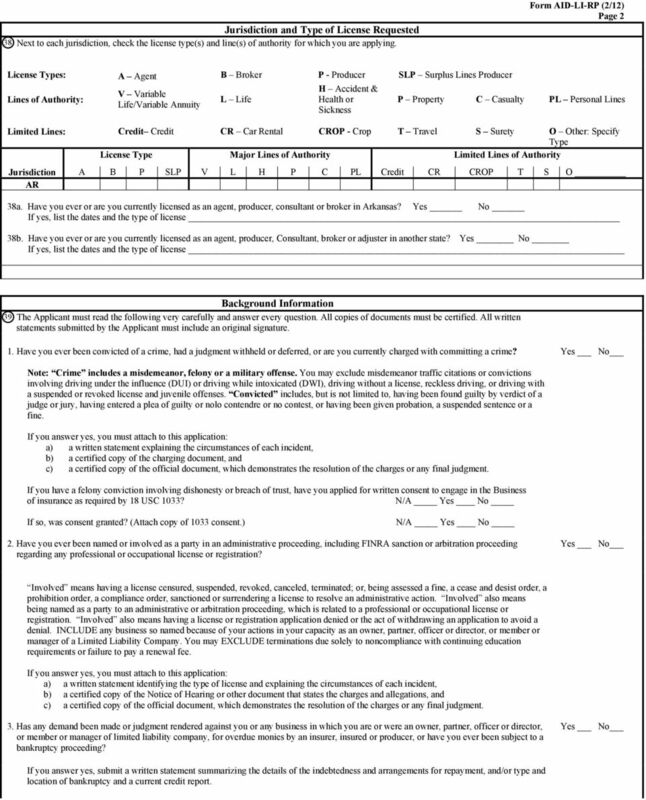 This form can be found on the Department s Web site on the License Forms page under the Business Entity section at (37) Employment History-- a required field you must show a full 5 years of employment history and your dates must be consistent. If you run out of space you can put information on a piece of paper and attach to the application. Begin with the present then work backwards. This chronology should also include unemployment, military service or full time education. 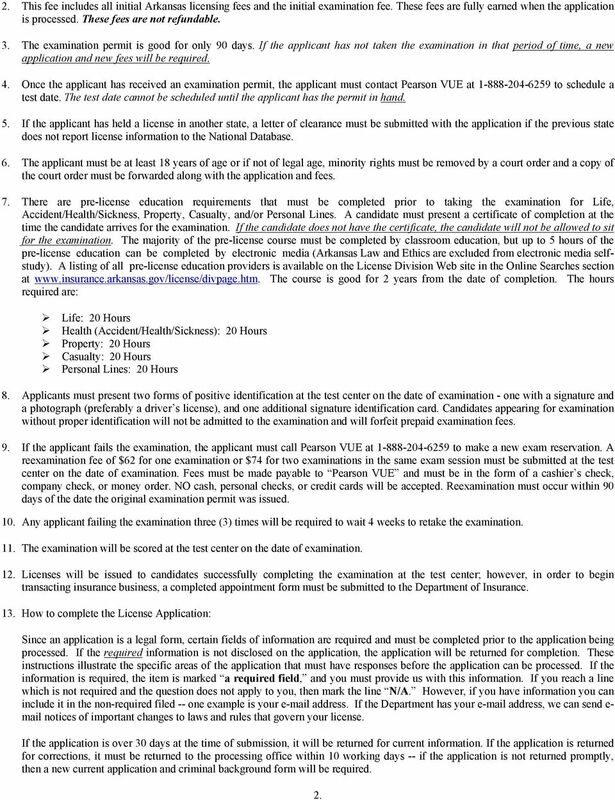 Page 2 of Application (38) Type of License---should be Producer---and Lines of Authority --- a required field Note: (Important) there are two types of property licenses: - Multi-Line (property, casualty, surety, marine) which includes commercial lines and personal lines coverages. - Personal Lines (only) which does not include commercial lines if you take Personal Lines (only) you will not be able to sell commercial coverages unless you retest, taking the Commercial Lines Examination. (38a) Have you ever or are you currently licensed as agent, producer, consultant or broker in Arkansas --- a required field. If yes, list the dates and type of license --- a required field 4. 9 38 Jurisdiction and Type of License Requested Next to each jurisdiction, check the license type(s) and line(s) of authority for which you are applying. Form AID-LI-RP (2/12) Page 2 License Types: A Agent B Broker P - Producer SLP Surplus Lines Producer Lines of Authority: V Variable Life/Variable Annuity L Life H Accident & Health or Sickness P Property C Casualty PL Personal Lines Limited Lines: Credit Credit CR Car Rental CROP - Crop T Travel S Surety O Other: Specify Type License Type Major Lines of Authority Limited Lines of Authority Jurisdiction A B P SLP V L H P C PL Credit CR CROP T S O AR 38a. Have you ever or are you currently licensed as an agent, producer, consultant or broker in Arkansas? Yes No If yes, list the dates and the type of license 38b. Have you ever or are you currently licensed as an agent, producer, Consultant, broker or adjuster in another state? Yes No If yes, list the dates and the type of license 39 Background Information The Applicant must read the following very carefully and answer every question. All copies of documents must be certified. All written statements submitted by the Applicant must include an original signature. 1. Have you ever been convicted of a crime, had a judgment withheld or deferred, or are you currently charged with committing a crime? Note: Crime includes a misdemeanor, felony or a military offense. You may exclude misdemeanor traffic citations or convictions involving driving under the influence (DUI) or driving while intoxicated (DWI), driving without a license, reckless driving, or driving with a suspended or revoked license and juvenile offenses. Convicted includes, but is not limited to, having been found guilty by verdict of a judge or jury, having entered a plea of guilty or nolo contendre or no contest, or having been given probation, a suspended sentence or a fine. If you answer yes, you must attach to this application: a) a written statement explaining the circumstances of each incident, b) a certified copy of the charging document, and c) a certified copy of the official document, which demonstrates the resolution of the charges or any final judgment. If you have a felony conviction involving dishonesty or breach of trust, have you applied for written consent to engage in the Business of insurance as required by 18 USC 1033? N/A Yes No If so, was consent granted? (Attach copy of 1033 consent.) N/A Yes No 2. Have you ever been named or involved as a party in an administrative proceeding, including FINRA sanction or arbitration proceeding regarding any professional or occupational license or registration? Involved means having a license censured, suspended, revoked, canceled, terminated; or, being assessed a fine, a cease and desist order, a prohibition order, a compliance order, sanctioned or surrendering a license to resolve an administrative action. Involved also means being named as a party to an administrative or arbitration proceeding, which is related to a professional or occupational license or registration. Involved also means having a license or registration application denied or the act of withdrawing an application to avoid a denial. INCLUDE any business so named because of your actions in your capacity as an owner, partner, officer or director, or member or manager of a Limited Liability Company. You may EXCLUDE terminations due solely to noncompliance with continuing education requirements or failure to pay a renewal fee. 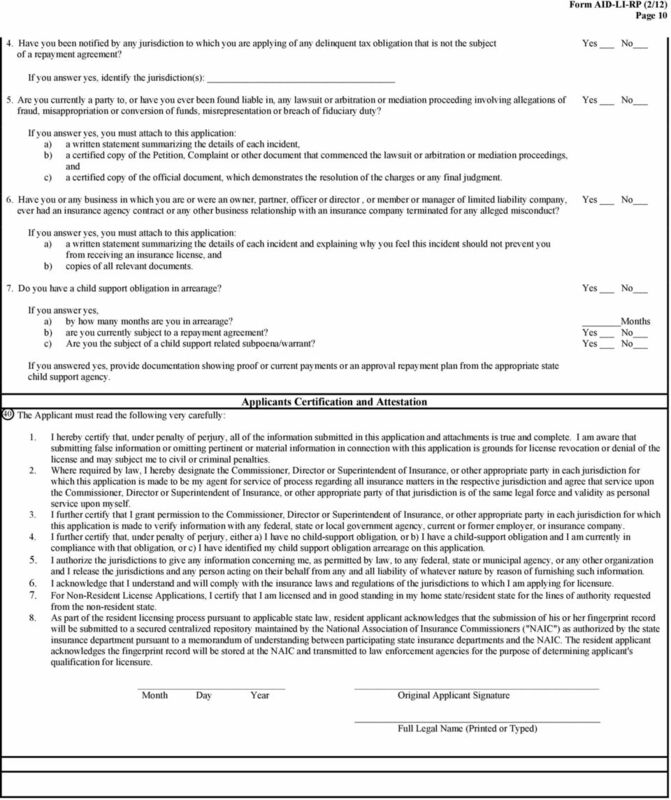 If you answer yes, you must attach to this application: a) a written statement identifying the type of license and explaining the circumstances of each incident, b) a certified copy of the Notice of Hearing or other document that states the charges and allegations, and c) a certified copy of the official document, which demonstrates the resolution of the charges or any final judgment. 3. Has any demand been made or judgment rendered against you or any business in which you are or were an owner, partner, officer or director, or member or manager of limited liability company, for overdue monies by an insurer, insured or producer, or have you ever been subject to a bankruptcy proceeding? If you answer yes, submit a written statement summarizing the details of the indebtedness and arrangements for repayment, and/or type and location of bankruptcy and a current credit report. Texas Department of Insurance Individual Insurance License Application This application is only for applicants who must take or have taken a Prometric examination and applicants for a temporary license. INSTRUCTIONS FOR CORPORATIONS, PARTNERSHIPS, TRADE NAMES, NAME CHANGES, ETC. Agent Appointment Application Transamerica Life Insurance Company Partner: Munich Re Stop Loss, Inc.